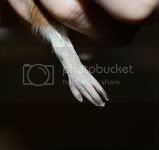 Polydactyly is a birth defect when a guinea pig is born with 1 or more extra toes. Polydactyly is most likely the result of interbreeding. In some cases your veterinarian may choose to surgically remove the extra digit to prevent tearing where in other cases your vet may just have you monitor it.